This movie was amazing! I was a big fan of the series, so this movie was long anticipated. After six long months of waiting for the sub to be released (with the bluray/dvd release) it's finally out. First things first, the story. They did an excellent job tying the story back together. While there was some disappointment with the ending of the series, this movie brings it all home. I was surprised by how many small points in the show were actually significant events what would be referred to in the movie. The show was a bit of a wild ride, but I absolutely love the story, theme , and setting. Everything about it is fantastic. However at points it can be hard to follow but it all ends up making sense. Next the art. They did an amazing job with the art style of this movie. It is not unlike the original series, with exception of amazing well animated fight scenes and a few amazing animations. I'm picturing a certain scene, which you will know after watching the movie. The sound quality was also amazing. Usually, I could care less, as long as it doesn't sound like someone talking through a paper towel tube. But this movie had some amazing points in which I found my headphones rattling. It really blew me away. Some of the scenes sounds like a huge budget action movie. So more than I could ever ask for. The characters were as good as always with some amazing depth. They really touched on all the main characters well, and even some side characters. The story is very intricate and will not leave you hanging. I would love to go more into detail, but I'd prefer not to spoil anything. Overall, it was an amazing movie, that inspired me to watch asap, and here I am writing my first review on MAL so that should say it all. Thanks for reading, and enjoy the movie! Mirai-hen is out now, and I watched it. The result? Well, it could've been better. It is impossible to say anything about the story because the first thing you watch is a major plot twist about the end of the anime series, and everything goes around that twist. A minor hint, though: the movie is full of Akihito and Mirai tears. My problem with the anime series was its drama, and how it wanted to force you to feel sad or be sympathetic with its characters. That problem continues in this movie. As the movie takes itself seriously, the drama I really didn't like is everywhere. I didn't grow emotionally attached to these characters, so for me the drama presented here is just there and nothing else. And the worst part is that what made the anime so enjoyable for me, i.e. the slice-of-life, comedy moments between the characters, just got in the way of that drama, making them out of place and very uncomfortable (or in the words of Mirai, fuyukai desu). One of the reasons why the comedy didn't work was the background music. The OST was made to make you feel sad, and basically the same sad violin song is played all along the movie: during the emotional parts, during the lighhearted parts, during the battles, during everywhere! Seriously, it is impossible to laugh at how Mirai fails to hit a tennis ball if funeral music is being played in the background. The ED song was good though. Minori Chihara has an amazing and beautiful voice, and the song is really connected to the events of the movie. The characters also got some mild development. Even though the characterization is attached to the emotional parts of the movie, it at least answer (in a way) very good questions posed by the anime series: how Mirai got her ring, information about her mother, some mild explanation about Akihito's mother. Hiroomi continues being awesome and keeps a bit of his main character quirks. Unfortunately, Akihito and Mirai spent most of the movie crying and suffering, and we didn't get to see a lot of what made them really likeable in the series (although that is supposed to happen, given the main plot of the movie), and Mitsuki continues to be the useless, Senjougahara wannabe I've got to know. There is little to say about the animation and art, only that it was, once again, absolutely gorgeous. Is Kyoto Animation, what can you expect? Although I didn't hate the movie, I didn't get to enjoy it that much. It suffers from lots of the flaws of the anime series, and neither the character development, nor the amazing animation, nor Hiroomi being the best character of the series could save the movie for me. HOWEVER, if you happen to be reeeeeeally attached to the characters, especially to Akihito and Mirai, and if you liked the drama of the anime series, then this movie would most likely be a 10/10 for you. In summary, I felt that the movie was good at least, if not great. There was many drama and cutting some loose ends from the anime. Now the reason why I said some was that there's still some other loose ends which are pretty essential, and this movie has covered some, but also created more. The story. It has many potential and they covered nearly all. Although there are some comedy, they stuck to the point, which didn't leave me hanging. They pretty much answered many questions. Personally, it was amazing, but the reason why I said "nearly all" was the fact that by the end, it was just it. I meant I asked many questions "What happened to this?" and "What happened to that? ", so on and so forth. I just begged more questions. The art. Long story short, outstanding. The animation, the visuals, everything, just great. The sound. They're great. Sounds effects, awesome. Music, beautiful. It could've been flawless, had they timed it right on some parts. Characters. 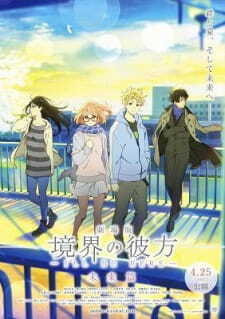 The movie covers mostly on the two main characters: Mirai and Akihito. I felt connected to them as they had to get through the suffering, especially from Akihito, as from the end of Kako-hen in the bonus scene (you better watch it first). The movie also told us the fate of the characters that went missing. However, the movie was so focused on these two that it left many other characters behind, including Mitsuki and Hiroomi. These two were pretty much left standing around, except for one scene where they find out who the masked person was, but even then, they weren't covered as much. Sakura and Ai-chan, yeah, they're just there. Enjoyment, it was good, but like I said before, it left me hanging around. It made me ask more questions both from the end of the anime and the end of the movie. Overall, it's a very good experience. Although it answered some questions, it does inherit some flaws from the series. Despite some flaws above, I personally recommend you watch the movie, if you watched the anime/Kako-hen of course. It's a great film. WARNING: The following review contains spoilers if you haven’t watched the prequel yet, read further at your own risk. This movie was such an elevation from the series. It had the aspects of a near perfect “Missing Piece Movie”. Honestly, this movie made me change my 'Kyoukai no Kanata' score from 7 to 8. It makes perfect sense to do so as well. Originally, I thought that the Kyoukai no Kanata series had a happy ending, which was…. you know, too straightforward in my opinion. But as soon as the movie starts, you find out that SHE LOST HER MEMORIES!! This breaks your heart a little and it’s what made me change my score of the prequel. Since it wasn't your average, ordinary, everyday happy-ending. The animation went up, compared to the series, and the music composition was amazing as well. Brilliantly composed OSTs, just as in the prequel. Okay so, in the prequel, I didn't get too much feels, since the character development wasn't the best there was to offer in a 12 episode series. But this movie had just enough character development from the past to make the viewers really feel what the character in the movie were feeling. I was thrilled and got the feels at the climax moments of the movie. I absolutely loved this movie. What wasn't there to enjoy?